NCHM JEE 2015 is knocking on the door as it is scheduled to be held on April 25. Candidates appearing in the most coveted hotel management entrance exam must be gearing up for the exam day. Careers360 brings you NCHM JEE 2015 Exam Day Guidelines to help you with insights on how to take the exam on April 25. Before detailing you regarding NCHM JEE 2015 Exam Day Tips and Strategies, we provide you a brief overview of the most sought after hostel management entrance exam with its pattern and marking scheme. What to follow before the exam day – Candidates can follow the do’s and don’ts provided below as the exam taking strategy. No need to attempt anything new–You need not attempt or start any new topic, which you might have missed during your NCHM JEE 2015 Preparation. Believe the fact as it’s of no use rather it’ll just create a fear or put stress on you. Revise your prepared topics – Rather than attempting or start reading any new topic, it’ll be more fruitful to revise your already prepared topics. The more you practice, the more you will touch perfection. Arrange your exam day documents and articles – Stitch in time saves nine! It’ll be convenient for you to arrange your documents and articles a day before the exam. It’ll save you from panic on the eleventh hour. Visit your exam centre personally – If possible, you are advised to visit your exam day a day before the exam as it’ll be helpful for you to track the actual time to reach the centre on exam day and help in avoiding panic. Keep Cool – You have practiced as much as you could during NCHM JEE 2015 Preparation Days. Now it’s the time to keep your cool and be calm as concentration is one of the important elements for winning. All you need to do is to revise all that you have prepared for. Boost your confidence – The fear of exam can lower your confidence so never let your fear overpower your confidence. It’s your confidence which will ultimately keep you high and boost your winning strategy. It’s just an exam like others that you have been appearing for. Measures on the exam day – Candidates can go through the following measures while buckling for the exam centre. Check your documents–You might have pre-arranged your documents and articles for the exam including NCHM JEE 2015 Admit Card, Pens, Pencils, Erasers and Photo-Identity Proof (in original as well as photocopy of the same). No need to carry unnecessary items – You need to carry personal items to your exam centre including mobile phones, calculators, electronic watches, notebooks, notes, books, etc as you will not be allowed to carry them along with you in the exam centre as submit it. Report 1 hour before the commencement of exam - You are advised as well as notified by the NCHM JEE officials to report at your respective exam centres one hour prior to the commencement of exam. Therefore, plan your timing in a way that you reach the exam centre by 9:00 am. Verify your seating arrangement – As you reach the exam centre by 9:00 am, it is recommended to check your seating arrangement by verifying your Roll Number/Registration Number and Name as pasted on the notice board of the exam centre regarding NCHM JEE 2015 Seating Plan. 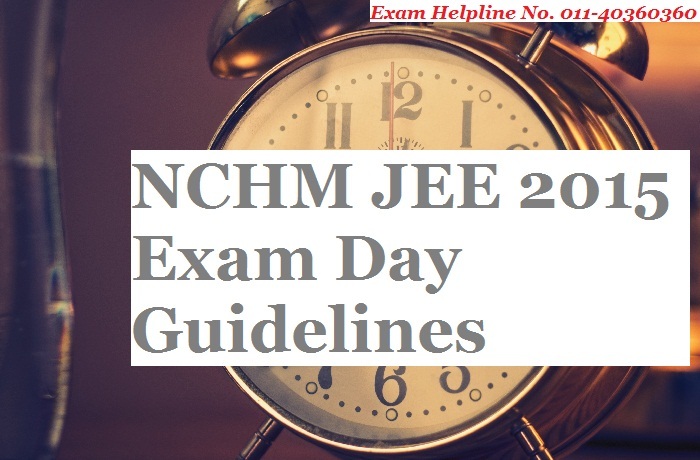 How to take NCHM JEE 2015 Paper – Experts have suggested here a few last minute tips for NCHM JEE 2015 aspirants who will be appearing for the most sought after hotel management exam on April 25. Numerical Ability and Analytical Aptitude–The questions form this section will cover topics like Number Systems, Percentage, Profit & Loss, Speed, Time & Distance, Algebra and Trigonometry. Therefore it is advised to solve the questions with tricks and fast calculations. The much fast you make calculations, the more questions you can attempt. However, you need to take care of accuracy too. It is also suggested to leave the questions for later if it involves longer calculations. Reasoning and Logical Deduction – They are quite tricky and one can solve it easily by following the questions careful. However if you are stuck in middle of any reasoning question, just keep it for later. Don’t waste time there. English Language – Candidates will be attempting questions based majorly on Synonyms, Antonyms and Spelling corrections. For comprehension section, experts advise you to read the complete passage carefully and then proceed for the questions. It’s obvious that you’ll lose time in reading the complete passage but it’ll help you in responding the answers correctly. Try to read the passage fast. There is no need to get panic for any word which is new for you. Try to attempt first the ones you know well and after completing the complete paper of NCHM JEE 2015, if you have time in hand, go for the new terms and unanswered questions. General Knowledge and Current Affairs –Here, don’t take risk of attempting the questions which you don’t know. Only attempt the questions which are known to you completely as one wrong response will reduce 0.25 marks (1/4th) of the marks. No guess work could be much fruitful. Aptitude for Service Sector – This section is only to test the aptitude for hospitality/hotel management sector and you will be awarded marks as per grade system. Experts recommend NCHM JEE 2015 aspirants to follow their inner-instincts for the section. There is no set pattern of strategy to deal with this section rather than going with what your inner-voice suggests you. Experts always mention time management strategy on the exam day. Your time management strategy will prove as the greatest tool to give you an edge over others. NCHM JEE 2015 is being conducted by National Council for Hotel Management and Catering Technology (NCHMCT) in a total of 33 cities in India for admissions to 7482 seats distributed among 51 institutes.